east side bride: She had me at leather. I am generally not a fan of boutonnieres. There's something emasculating about them. As H-town put it when I enlisted his help in talking TTO out of organza,* "It looks like prom.... It defies the best-case scenario for wedding apparel, where the guys look cool and tough, and the ladies are all dolled up and decorated with flowers." 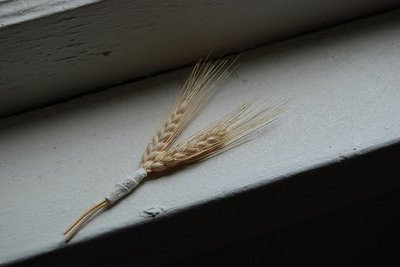 But Afton made these minimalist boutonnieres** out of wheat stalks and white deer leather. Nothing emasculating about that. Plus they're not just for the groom and the groomsmen but for her parents, godparents and family members. *IknowIknow. I'm bossy. But that's why you love me.... Right? **Also, I refuse to call them "bouts." Gag. 2. I didn't really like them either until my awesome florist friend made up the ones for my wedding. They were just one of those curly ferns and two pieces of wheat in honor of my grandpa who is a farmer. I loved them! Oh yeah, and thanks for nothing for posting that picture of Jane and Serge. I've just finally got the bangs grown out and now I want to cut them again. Ha! now these are some boutonnieres i can get behind. More concurrence that bouts = gag. Why not just call it a buttonhole though? I like these two. They're like V-signs to the whole thing. Whenever I see "bout" I always, always think, "...had a bout of the flu". 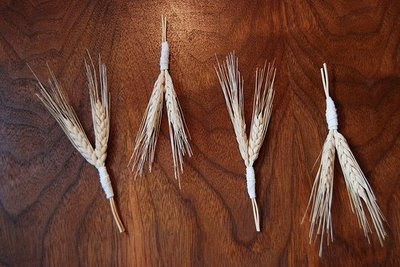 I love wheat - maybe its just the Kansan in me, but wheat is wonderful. Yeh, I hear ya, but a spelling boutonniere is a serious project every tim you do it. Just sayin sometimes laziness wins the day. ... and of course I mispelled "time" in my comment ... maybe I should be allowed to stik with "bout" due to my obvious spelling disability? Why are weddings supposed to look like grownup prom? It's not like prom is a moment of high fashion to be emulated. Why do people get upset/ discombobulated when you deviate from the grown up prom plan? Holy crap those are *perfect*. And don't judge "bouts"! Ha! I always type "bouts" out of sheer laziness and the fact that I can never manage to spell boutonnieres right! I'm not sure if we love you because of your bossiness or *despite* your bossiness. Either way, we love you. but i SO call them bouts.